I was stunned, quickly swept up in such brilliant insight. We were in staff prayer time; I was standing by the bulletin board. A section of this board holds William’s drawings of various Bible stories. Lifting my eyes while listening to others pray, this particular composition’s title grabbed my attention. Carefully scribed on the page is a combination of both thought-provoking words and detailed sketch. His picture’s simple, crisp lines drew me to further consider the implications—both deeply theological and practically down-to-earth. 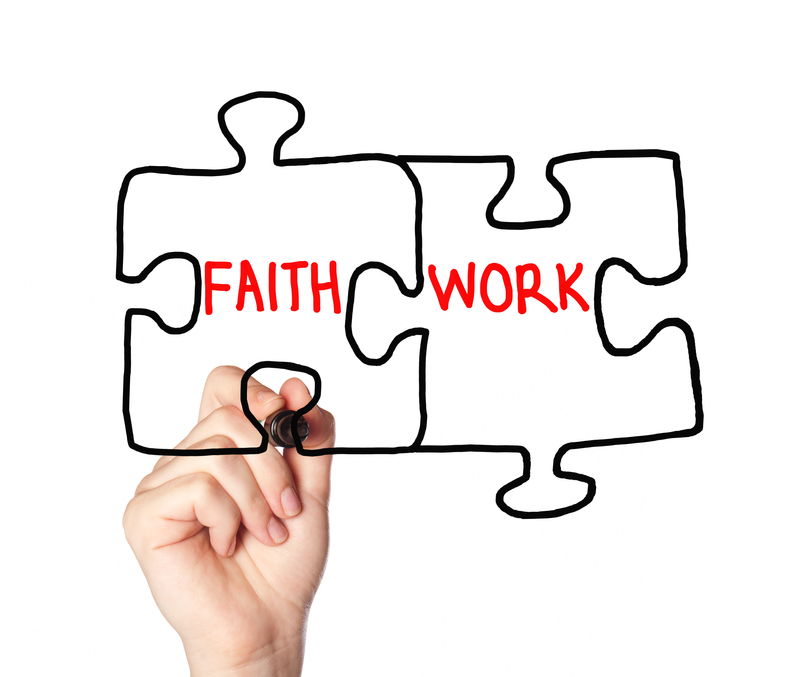 Our church has been on a faith @ work adventure over the past two years, deliberately seeking to engage with God’s view of our daily work. We are aiming to see more clearly how we join his mission in our daily tasks. We’ve been learning to break up the sacred-secular divide, to view and do our ordinary tasks as kingdom initiatives, and to appreciate our everyday workplaces as our primary mission fields. By his grace, we are beginning to see God in all things, even in the dusty and seemingly mundane. It should not have surprised me that William Faris’ artwork expresses kindred theoretical sentiments. He listens carefully in church services and his weekly Life Group study. His hands then skillfully join his mind, both working together to express what he sees. This particular drawing is simple yet poignantly intriguing. 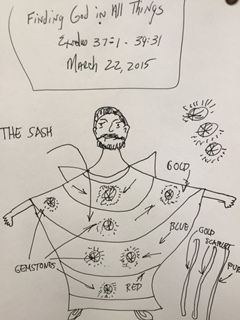 A bearded stick figure is draped in a strange-shaped gown, with unique décor embellishing the garb. William supplies a top-of-page biblical passage as the source of his inspiration: Exodus 37:1—39:31. My suddenly curious yet cursory review of this Scripture validated my dusty recollection. Here is a description of the work performed by the ancient artisans of Hebrew sacred relics. Bezalel, Oholiab, and a team of craftsmen created the Ark of the Covenant, tabernacle furniture, and the priestly garments. Chapter 36 sets the stage: “the LORD has given skill and ability to know how to carry out all the work of constructing the sanctuary . . . to do the work just as the LORD has commanded.” I am deeply moved by this realization: such scriptural setting supplied inspiration for William’s own artwork, now thousands of years later. I must confess the reason I am so stunned. William Faris faces a great personal challenge; he lives with a profound cognitive disability. Now in his fifties, William lives in Faith Friendship Villa, a couple miles from Manor Church. He faithfully attends worship services each weekend along with other residents. 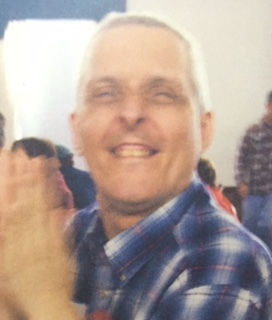 Willam and friends are vibrantly involved in their Life Group, led by people who are lovingly committed to working with individuals and families affected by disabilities. With such passionate work, this group regularly chooses to see God in all things. So, I am personally stirred by William’s artistic expression. Not only does he reflect theological savvy in his sketch; his own work remarkably reflects the image of his creative God and the extraordinary capabilities God has granted. Drawn in by his work—both the sketch and the link to the biblical account—I am stirred afresh by the fact that it is God who gives skills and abilities to workers. William captures with loving stroke of pen on paper the old, old story. And he embodies with vibrant Spirit the very essence of such gifting. As William Peel reminded our crowd, we can see God at work daily in all things. WIGD? We see God at work through William Faris and his art. And I am further captivated, swept up in this oh-so personal, yes, even convicting question: Am I personally integrating each day with such skillful sophistication—daring to see God at work in the “all things” of my own life—both in the old, old story, and in the current story of our lives? Bill Peel and Walt Larimore. 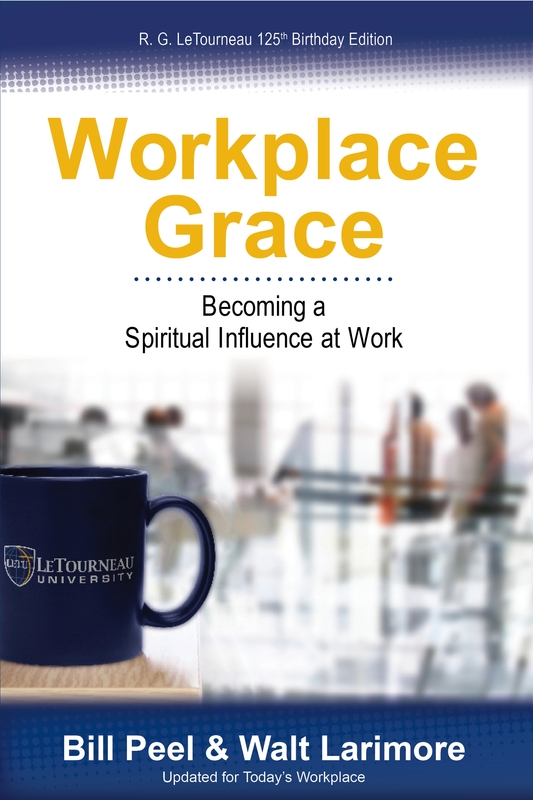 Workplace Grace: Becoming a Spiritual Influence at Work. (Longview, TX: LeTourneau Press) 2014.